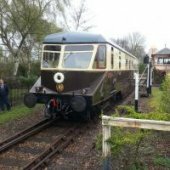 Hi Guys I have been a Passenger guard for ten years and diesel rail car driver for a couple of years at the Didcot railway centre. Although I have no association with the big railway I am getting quite wound up with the current trend to remove guards from our suburban trains.The media are having a field day alleging the resulting dispute is all about who closes the doors. Good Grief! Granted on preserved railways the Guard has to check all slam doors are closed and all passengers and onlookers are clear. When it is Safe give the right away to the driver. Having boarded watch the platform during departure. If an incident occurrers you (guard) can stop the train by putting in the brake setter. Trust me during my ten years I have had to use the setter several times. My point is that Guards are a safety critical member of train crew. With their knowledge of the route and the emergency procedures not to mention a professional preasance and assistance to passengers, I think a qualified Guard is essential. What do you think? Dave. Here in the UK it was also a dry day but not so sunny. I know what you mean about household electrical goods. Same here. Gem Mercontrol groundframe levers can be found at www.lytchettmanormodels.co.uk. there are several levers both single and frame. My system does not use the wire in tube method due to the distance involved. Levers 1 to 6 are servo switches. The rest are Mercontrol lever frames. An 8 way and a 6 way . These connect to the points with steel cable running through tiny screw eyes. At the point it connects to a bell crank and a tension spring. So far so good, I can adjust the cable tention at the lever frame. There is a different approach with the 6 way, I m using heavy duty fishing line to operate mostly signals on this frame. The same spring tensioner is used. This one has a mini microswitch to change a point position signal. The servo switches control a servo controller and servos which throw points that are difficult to run manual cables to. It has taken a few attempts to come up with the current system. Both the steel 1mm cable and the 30lb fishing line work as well as each other mechanically, the steel cable looks better though. The furthest signal under manual control is 18 feet and 17 feet for a point. Most are much closer. Dave. I have ordered a 12 Amp hour battery. Meanwhile here are some pictures of my little solar system. The white connector box is for 5v out for the three lighting sets. Hi guys Well this is encouraging. Jimbob I think I will follow your lead and invest in a bigger battery. All my electrics are 12volts or 5volts and dcc track power comes from inside the house, so I don't need an inverter. I do fancy one though. I will tidy up my (embarrassing) wiring and post some photos. Dave. Hi all Here are a few photos of the Goddard junction railway layout. All the buildings are glued down after I collected them from the grass having been blown off by the wind. Lights are installed in the town and stations. I have used outdoor timed micro led sets (about £3 each from eBay) they come on for 6hrs and off for 18. So far so good with the Mercontrol signal and point levers. The best control wire seems to be 30lb fishing line. My 1mm steel rope wire in tube idea failed as it binds too easily. Tony, thanks for your advice. looks like the photo upload issue was the file size of my new phone camera. I went back to my old phone for these pics which uploaded fine. Thanks for the video Roddy. That is a very impressive lever frame. Definately food for thought. All my control gear is on the surface of the baseboard, a small modification to the frame would accomodate surface oporation. Great idea for bellcranks, I will be giving that a go. Hi all Thanks for your supportive comments. I am still new to this part of the hobby. That is why all your comments are so welcome and helpful. Tony, that looks a mighty strong baseboard looking forward to following progress on your layout. Just posted another short vid on youtube. link above. I must get on with the point rodding and ballasting. Heres to a good summer. Hi Guys I seem to be having problems loading photos to my postings. I am using the same source as before and the same file size. It goes through the upload progress bar then reports an error. Same thing with the gallery, I've created a new album but cant upload to it. Has anyone got any ideas? Hi All Well I have made a start on all those Ideas that you get during the winter nights. All main line points upgraded to express points. Branch line extention with the addition of a small villiage. The other thing I wanted to do, was one of those drivers eye view videos. Having purchased a tiny camera to blue tack to the front of one of my RC locos, all high teck stuff here. I recorded a test run today in the rain, that will be a bank holiday then. I edited the resulting video and watched the finished product. This is the first time I have seen the railway close up, you can see everything. I have now added about 200 more jobs to the to do list! I have put the video on youtube under Goddard Junction Railway. Im having a problem uploading pics to my posts at the moment but will keep trying. Further report.on Groundframe. Having tested my electro powered groundframe which works well, I felt that I was cheating. I went back to the Mercontrol leverframe and changed all the wire in tube bowden cable for cord. Using a heavy duty braided fishing line. This is spring tensioned and so far so good. I will let the weather get at it for a few days and report back.